You may have seen in my recent haul that I picked up this oil, and after testing it for around a month I felt like it was the perfect time to give you guys a review! This past winter my skin has been worse than ever. No matter what I used my skin was noticeably dry and I even started getting patches of eczema on my eye lids – which if you didn’t know is the worst place to get eczema. 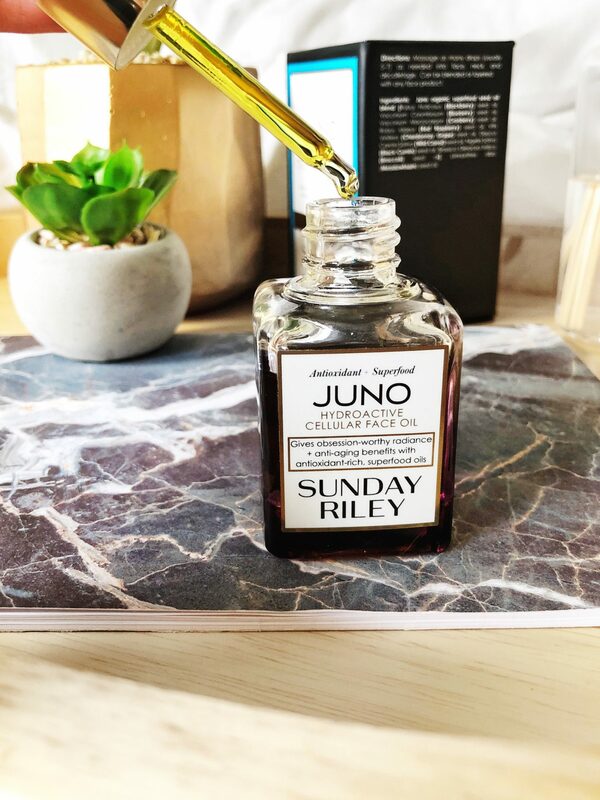 After trying practically every oil that The Ordinary offers and an insane amount of moisturisers, I finally bit the bullet and bought a Sunday Riley product. 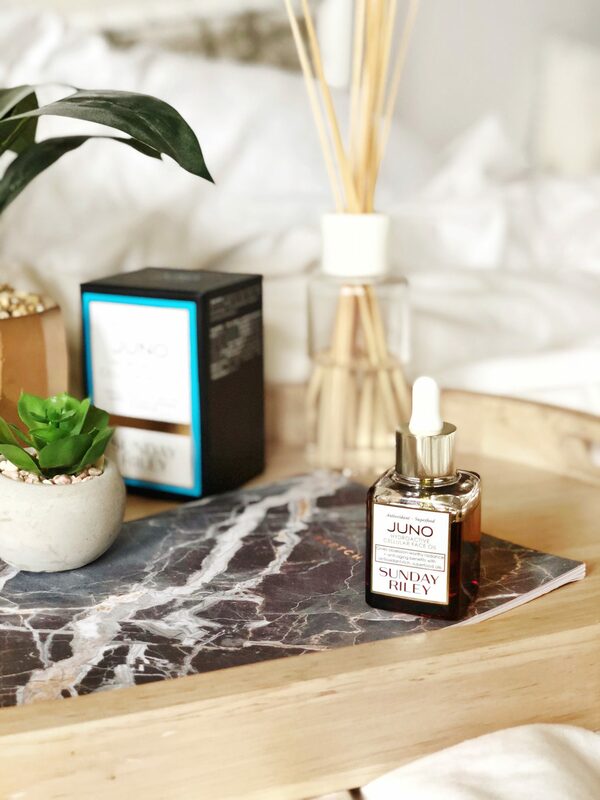 I’d heard nothing but incredible things about the brand and figured they were pretty much my last hope before I’d need to find a dermatologist – my skin had seriously gotten that bad. 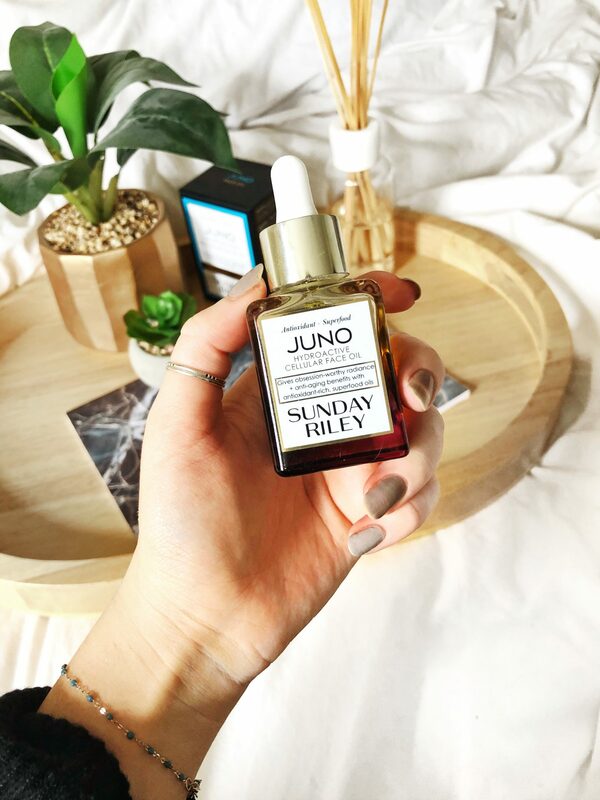 I did my research and figured that the Juno Oil would be the best way to go, since it’s supposed to be the most hydrating. At £35 for 35ml it definitely isn’t the cheapest product out there, but I actually think for a luxury oil it’s a fairly decent price. I was also willing to spend any money at that point just to fix my skin. One of my favourite things about this product is that it only contains oils. There are no scientific-sounding or confusing ingredients that sound somewhat concerning or alcohol-related (which always dry out/irritate my skin); the only ingredients are a range of superfood seed oils that I know will be good for my skin. The packaging also gets an A+ from me. I love the minimalist-chic design and the beautiful, high-quality box is a nice touch too. The bottle is a pretty decent size, and since you only need about five drops of this I think it should last a relatively long time. The first thing I noticed when applying this oil is that it felt a lot more luxurious than most oils. I’m not even sure if that makes sense, but it felt a lot thicker and creamier than any oil I’d used before. It also sinks in to the skin really well but leaves it feeling so hydrated – if I didn’t have such dry skin I honestly think I could use this alone as a moisturiser. I like to use about five drops of this in an evening with moisturiser, and a drop in the morning mixed into my moisturiser. After the first day I noticed my skin feeling so much softer, but now having used it for a month I can see a drastic change in my skin. Not only is it so much softer, I also have absolutely no dry patches anymore. I’ve also noticed that I almost never get breakouts anymore (I’m thinking it’s the antioxidants) – I used to only really get them if I ate too much sugar or was on my period but now my skin is clearer than ever. I even feel confident enough to go without foundation because my skin looks so healthy and radiant – I’m beyond impressed. Overall I’m completely in love with this oil and the brand as a whole. I’ve never used anything that has had such an impact on my skin and I’ll absolutely be buying the bigger size when I’m out of this. I definitely want to try more from Sunday Riley too, so please send me any recommendations! Great review Amy, it’s sounds like a very good skincare product. Must look into getting this when I have some spare money. Oh damn now I need this too! Might have to save up and then splurge, I just worry about it being a waste on my skin!